It’s an important part of everyday company culture. What’s Trending in Workplace Gratitude? As the value of workplace gratitude gets more recognition, leaders are exploring its impact and studying how to better implement it. The power of a positive, appreciation-driven culture is clear. Employees at organizations with positive cultures scored significantly higher scores in leadership caring, confidence and listening, a CultureIQ poll found. What comes first, employee gratitude or employee happiness? We can “live for days on just a little gratitude,” as this adorable Gaping Void art illustrates. It’s tempting to let perfectionism and “happiness-chasing” get in the way of actual workplace happiness. Are you inspired by Random Acts of Kindness Week to build workplace kindness in your organization? Now’s the time to start. Only one in four employees feel valued at work, a 16 percent drop from last year, according to the TINYPulse 2017 Employee Engagement Report. Random Acts of Kindness Week starts in just a few days! Are you ready? We love RAK Week as an opportunity for employee engagement: it’s fun, it’s positive and it connects people in a genuine, memorable way. Want to attract top candidates who’ll stay loyal to your company through thick and thin? You need a dynamic employer brand that immediately stands out to potential employees — the kind of employer brand that not only attracts the right people for the job but gets them excited and keeps them around longer. The celebration-filled holiday season is over, party streamers down, gifts shared and game prizes won. Now what? How will you sustain that workplace spirit and employee happiness into 2017? 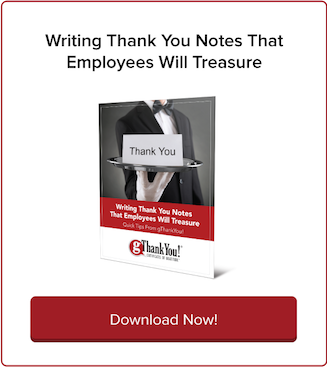 gThankYou is excited to release our employee recognition calendar for the New Year. 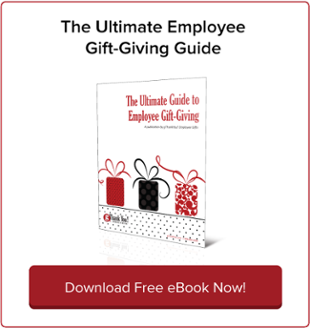 Absolutely free to download, this day-to-day guide to year-round employee engagement is our holiday gift to you. Sorry. It’s the one word that may be holding back you and your team from building a stronger culture of workplace gratitude. Apologies have their place. But you’re probably saying “Sorry” when “Thank You” would be better. It’s November, and that means the holiday season of gratitude is here! Seize the opportunity to honor and celebrate with your staff — write a Thanksgiving letter to employees this month. Is your workplace Thank You inspired — or is it tired? It’s critical for managers and company leaders to thank employees for excellent performance, and do it effectively. Believe it or not, there is a wrong way to thank someone! 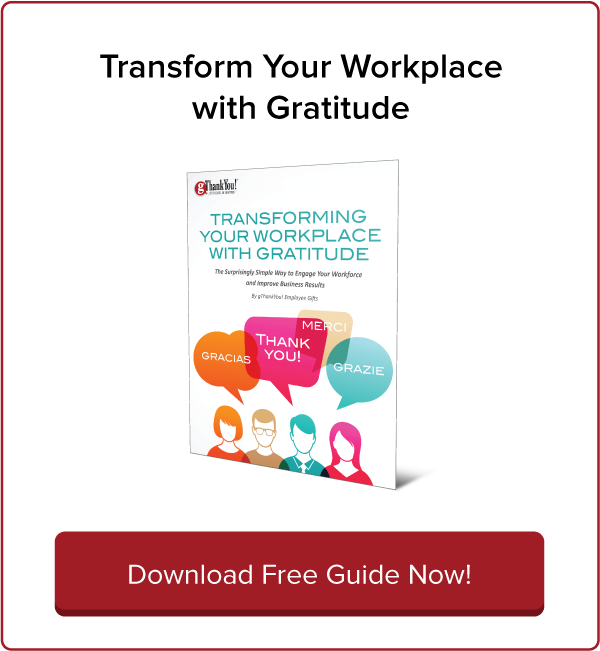 Is mindfulness the missing element in your workplace gratitude culture? A workplace gratitude culture that doesn’t sustain a commitment to mindfulness is like a flame without oxygen — it will quickly flicker out. Employee recognition feels good, but does it get results? We know most American workers still don’t get enough on-the-job recognition. Only one in three employees in the U.S. strongly agree that they received recognition or praise for doing good work in the past seven days, according to an analysis of Gallup’s latest employee engagement poll. A strong culture of workplace gratitude is the “X factor” in many companies’ success — and they didn’t build it by waiting around for a lavish recognition budget or the perfect circumstances. Want Real Workplace Happiness? Practice ‘Arbejdsglaede’! In Denmark and other Nordic countries, workplace happiness is so common there’s a word for it. What is arbejdsglæde, and how can we create an American counterpart? Alexander Kjerulf, a Danish author and employee engagement expert, brought the concept of arbejdsglæde to an international audience with his book, “Happy Hour is 9 to 5,” and popular blog, The Chief Happiness Officer. Appreciation is a well-documented key to employee happiness, so why isn’t it more prevalent? According to HubSpot’s Jami Oetting, we’re too distracted by the fast pace of today’s workplace. Let’s celebrate happiness! International Day of Happiness is today — Sunday, March 20! 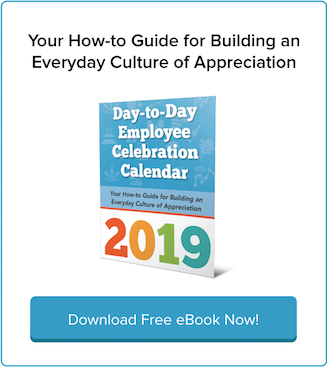 Include your employees in this United Nations global celebration to reaffirm and clarify your company’s commitment to building employee happiness.